Of course, we always knew that as we grew larger, there would be cost to using Google Maps. Up till now, free usage limit of about 750 thousand map loads per month was well aligned with scale when one can expect to generate revenues that cover the cost. Price for commercial usage ($0.5 for 1000 map loads) was not high enough to consider alternatives. Importantly, prices are the same from US to the Africa, despite the fact that revenue generation is vastly different in most developed countries compared to the others. We know it well from comparing Polish market to Germany, as we expand there. If we maintained current monthly usage of both maps and Places (ie. 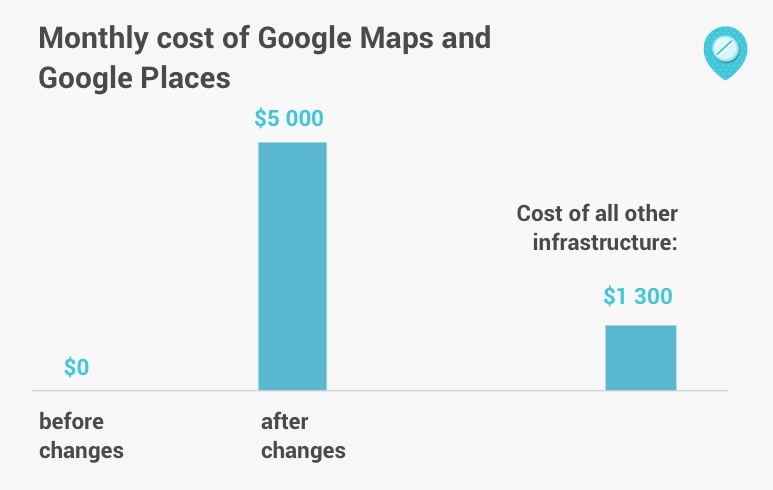 location search), the cost of Google Maps would be multiple times higher than the total cost of all other infrastructure. Google Maps is objectively the best product on its market, in many regards positioned light years ahead of its competitors. Excellent analysis of how advanced are Google's maps compared to the others was published by Justin O’Beirne. The good news is that even though maps are such an important part of our user interface, they serve no more advanced purpose than effectively visualising locations of pharmacies. Therefore we do not use advanced functions which are most likely to have proprietary APIs, such as satellite images, routes calculation and others. On the first glance, it seems that almost all providers would provide satisfactory experience as far as centre of Warsaw is concerned. One exception might be Azure Maps, which was made available just in the previous months. To be fair, Microsoft claims that perceived emptiness of its maps is intentional and for the benefit of its large corporate partners, who like to overlay a large amount of their own information on the maps. 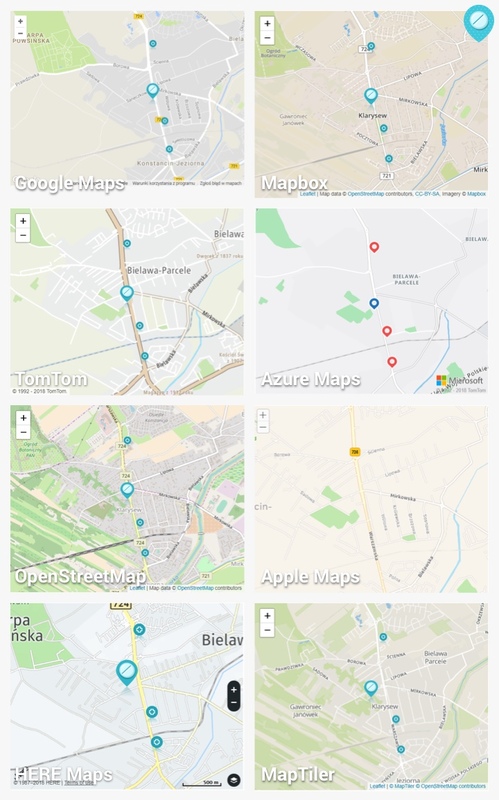 Despite our initial concerns, it turned out that we are not hostage to Google Maps after all and many alternatives look surprisingly decent in Poland. Added: often there is an opportunity to create a custom map style, which we didn't explore as we don't use custom maps on our site. But it's clearly an important thing for Mapbox, where mentions of various editors confused us slightly at pricing (below), and MapTiler (customisation tutorial here). We find Google model most transparent (leaving aside the price), because every web site page view with a map on it will have the same price. In case of paying by each map tile, as with MapTiler, things are getting more complicated. How many tiles are present on each map depends on its size, which in case of responsive sites might be different for each user depending on the screen resolution. Apart from that, user might move map around or zoom, drawing further tiles. The least transparent we found the pricing terms of Mapbox. Not only it's unclear how many tiles are calculated for each "map view", the term itself is misleading (other companies use "transaction", which doesn't imply that it's a full cost for map view like with Google Maps). From looking at pricing terms it's hard to reason what would be the actual daily cost for the whole site. 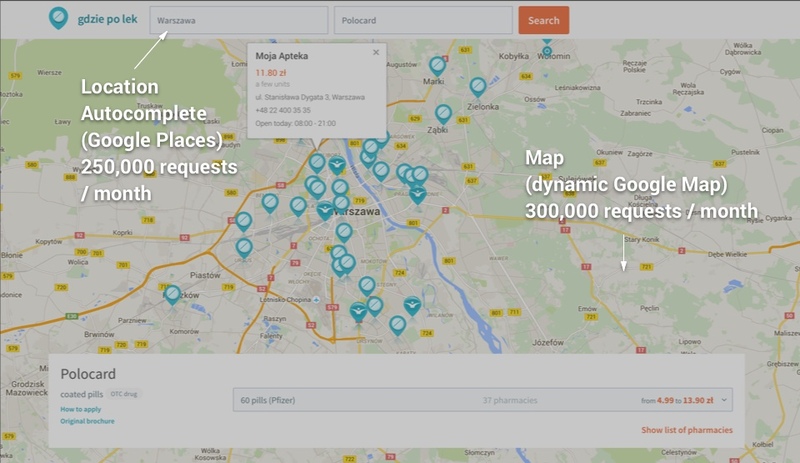 Our startup, for example, uses both small maps on pharmacies' profiles, as well as huge full-screen maps presenting search results - but only for desktop users. Which maps should we investigate deeper? Some options we could reject quickly for various reasons. OpenStreetMap is not supposed to be directly used by commercial sites. Apple Maps, even though we wouldn't mind having Apple logo on our site somewhere, was just released as beta and requires Apple developer account to test properly. HERE maps seem a poor match visually for our site (too stark), have proprietary interface and we prefer pay-as-you-go billing to bundles. But a large site that we know decided to migrate to HERE, so we will see how it works for them. Such opportunity can be had if we went with Mapbox or MapTiler, and perhaps TomTom, which, however, uses a slightly modified Leaflet client and requires pre-paid billing instead of pay-as-you-go which we prefer. We upgraded our web application in order to be able to switch map provider by a single click in the administration console. Then we watched amount of resources that we consumed daily in case of each short-listed map provider, ie. 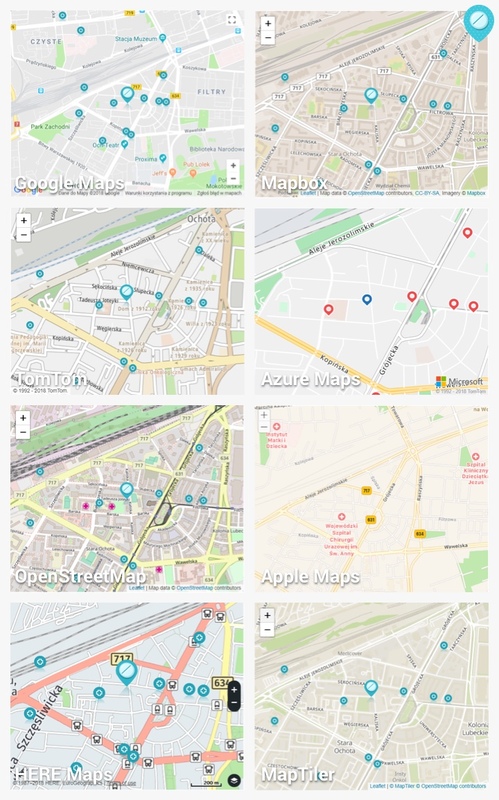 Google Maps, Mapbox and MapTiler. Google Maps would have most favorable model for users of big and intensively interacted with maps, like us, but radical price increase puts the cost way higher than alternatives. 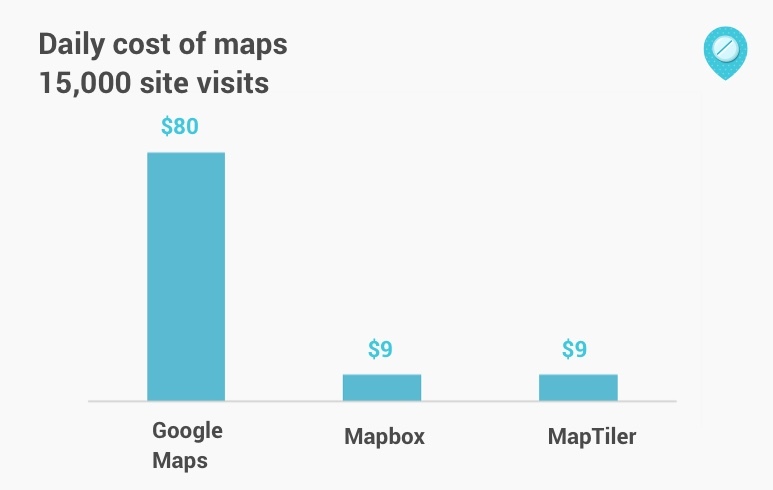 As it turned, cost of using Mapbox and MapTiler in our case is comparable, despite slightly different billing model. Mapbox has more resources to its disposal - 400 employees according to LinkedIn, compared to MapTiler's 7 team members - thanks to Softbank's $164m investment. On the other hand, having acquired that much capital, the company is branching out in several directions (autonomous driving, VR...) which for a user dependent on its maps service might be somehow concerning. Therefore we will keep using both services in parallel. 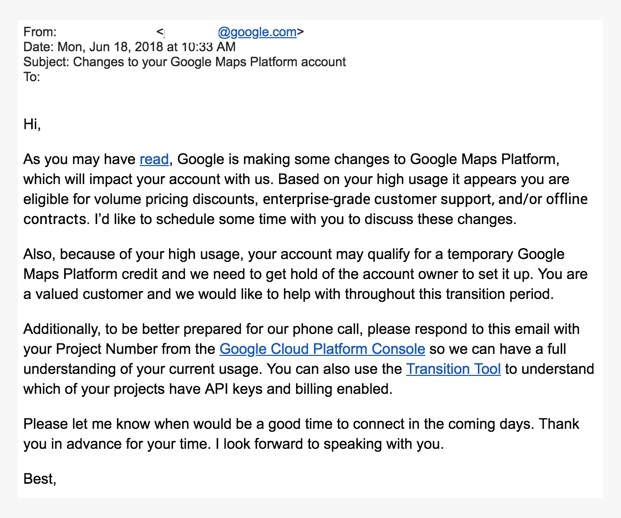 If not for radical price hike, we would not embark upon looking for Google Maps replacement, as it would be clearly a "not broken - don't repair it" situation. Sudden change of policy by Google, which is directed specifically at startups (as smaller web sites should largely remain below even the new lower thresholds), is surely an unpleasant surprise for us and does not create much trust in Google as a vendor. In the future we would therefore keep our distance from Google Cloud and avoid deep integration with any Google services on which it can pull a similar trick. For example we would be wary on taking free Google Analytics for granted.